SNMP4J-AgentJMX implements a descriptive mapping from JMX MBean instrumentation to SNMP scalars, tables, and notifications. Map MBean values to SNMP table columns and vice versa. Map tabular JMX data to a SNMP4J-Agent mutable table model. Map an internal row identifier of a table to a MBean ObjectName. Map scalar SNMP values with MBean based instrumentation. 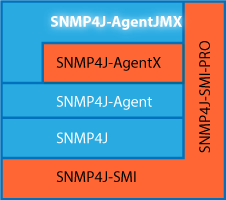 Map tabular JMX data to a SNMP4J-Agent table model. Map MBean tabular keys to SNMP table indexes. Forward JMX notifications as SNMP notifications (traps).